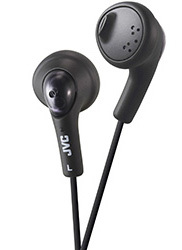 Perfect for music applications due to their sound clarity, these Earbuds feature a comfortable design. Features high-performance 10mm drivers for deep bass. The Riptidz headphones feature a sweat proof body and a secure fit, ideal for the active user. Delivers all of the impressive sound quality and superior bass response that you expect from a Sennheiser product. Best-selling Gumy earbud headphones feature a soft rubber body with an oval shape that provides a snug fit and include a tangle-resistant color matching cord. An ideal choice for high quality music on the go.